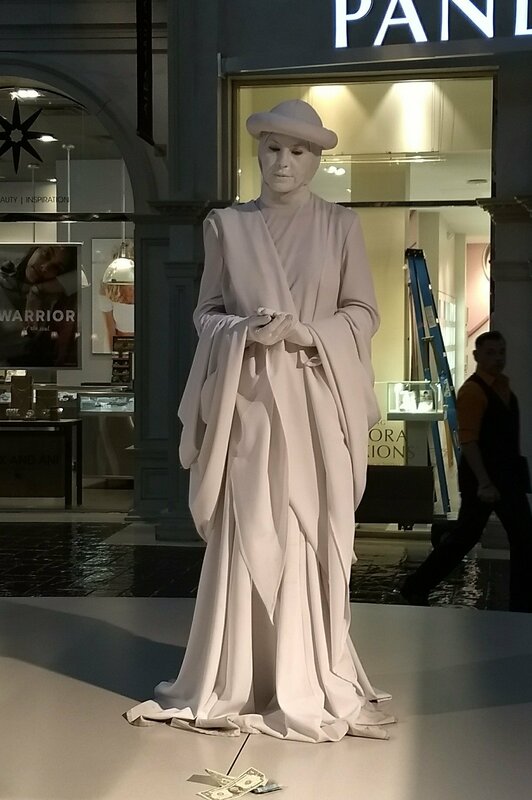 So there’s this lady who painted herself all white, and wears all white clothes. She stands real still and pretends to be a statue. She’s a real person, pretending to be a facsimile of a real person. That’s her job. People give her money to pretend to be a fake person. Shucks, I gave her money. It’s funny. Instead of art imitating life, it’s life imitating art imitating life. The curious part to me is why is it so fascinating to look at? I guess it’s because it’s hard to believe a real person could stand so still and look so fake. But why should that be interesting? There are plenty of people in this world who are going nowhere and constantly faking it . . . and most of them even get paid for it. 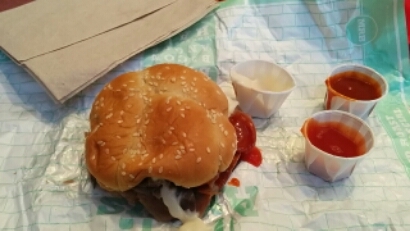 If you don’t need a napkin when you eat your Arby’s sandwich, then you didn’t put enough sauce on it. I wonder if life is kinda that way too. If it doesn’t get a little messy sometimes, then maybe you aren’t doing it right. I have been thinking about rainy days lately. In recent weeks, we have had our share of cloudy days. A few weeks ago, the basement flooded again. We had allowed the gutters to get clogged, so the rainwater just poured beside the house and made a mess. But that is not really what I have been pondering. What has been on my mind, is that not all rainy days are bad. I remember one drizzly day long ago. Tammy and I were not yet dating. We connected with friends, took a long walk on a damp day and enjoyed each other’s company. Our clothes were nearly soaked as we walked along a railroad track. I can’t really explain why it was such a wonderful day. Perhaps deep down we knew there is something special about a person who will walk in the rain, just to be with you. I also remember a day a few years ago at Cloudland Canyon State Park. We went to bed one night planning a hike for the next morning. When we woke up, it was raining. I was disappointed. I thought the rain would ruin the hike. When it slowed to a sprinkle, we decided to go anyway. Packing snacks and a rain poncho in our backpacks, we started out. I figured we would get drenched. That’s not what happened. While we hiked through the woods on the way to the canyon, the occasional sprinkle gave way to a cool, gentle mist. As we approached the canyon overlook, I thought we wouldn’t see anything. I was wrong. What we saw were misty clouds gently floating in the canyon, giving an occasional glimpse of the far side canyon wall. It was as if we were standing on an island in the clouds, and it was magical. If there is any point to this post it is simply this: Not all rainy days are bad. Some can be wonderful, or even magical, if you give them a chance. Close, but never there. Grasping. Not quite old or young enough. Almost correct and almost right. Success seems scarce, Yet blessings abound. The end of life. A talk with God. Nothing else will matter at all. Deer, Car, Buzzard or Bones? Sam and I came across some bones while on our Sunday walk. A skeleton of sorts. 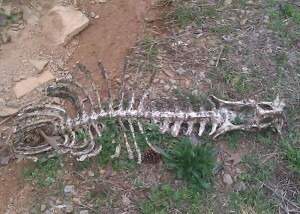 It was the backbone and rib cage of what I can only guess was a deer. It was kinda weird to see it laying there by the side of the road so we stood for a while, trying to figure out what it was. Before concluding that it had been a deer, we speculated on a few other options . . . an alligator perhaps? A very large dog? Maybe a dinosaur whose bones had been washed up by the rain? 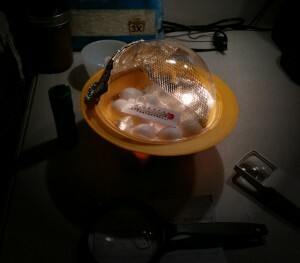 OK, maybe not a dinosaur, but it was fun to speculate. Where did these bones come from? He was running along in the woods when he decided he was not happy where he was. He wanted to be someplace else, so he headed out across Buford Highway to get to the woods and the gravel road on the other side. Along came a car and ruined his plan, blindsiding him. Mortally injured, he stumbled on across the road and down to the woods and gravel road along the other side. There, he finally fell in the ditch and died. 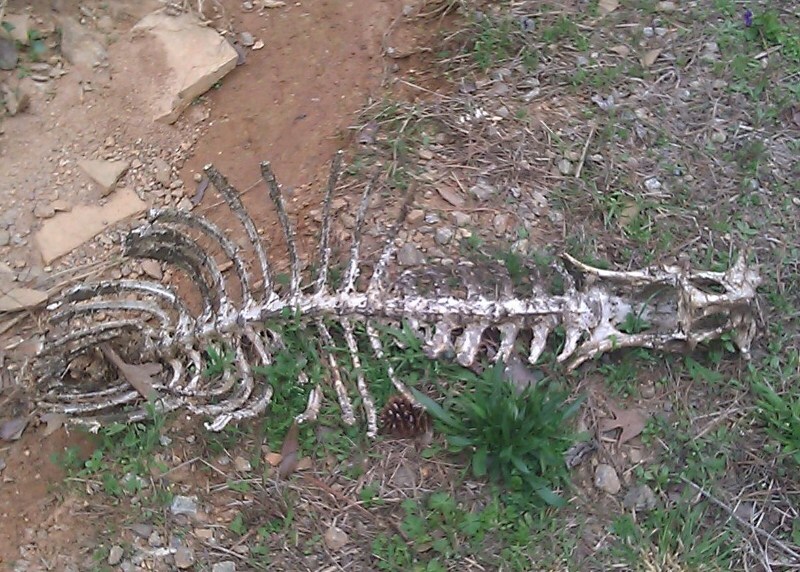 The buzzards must have promptly picked away at him, leaving just these bones laying by the dirt road. The story is familiar. It happens to people too. They go the wrong way at the wrong time and get blindsided. Then along come the “buzzards” to pick at them while they are down, tearing away all that is left of them, leaving nothing but dry bones and no life. Sometimes I am the deer. Sometimes I am the car. Sometimes, I am even the buzzard. And there are definitely days when I feel like the dry bones. But God, He is the one that can give life even to dry bones, and thankfully, He does.